Tonight is the eve of a new year, starting a new decade in a new millennium. Just barely recovering from all the festivities of Christmas, tonight is one of the biggest festive nights of the year all over the world. 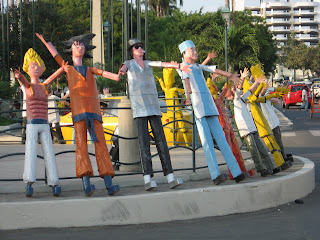 New Year's Eve is an exciting holiday in Ecuador, full of tradition, politics, and history. People of all ages participate, and the city streets are full of people. 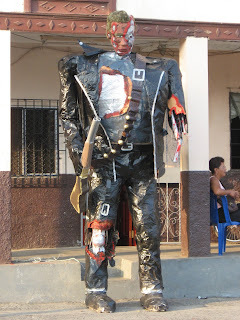 During the day many men are dressed as provocative widows of the old year known as viudas. These viudas are not very upset about their husbands' death, and tend to act promiscuously. Dressed in skimpy black clothes, tights or nylons with a black shawl around their shoulders, the viudas stop traffic at various busy street locations with a rope drawn across the street asking for money to help pay for their husband's funeral and offering a promiscuous dance in return. The money collected is used for the New Year's Eve party. 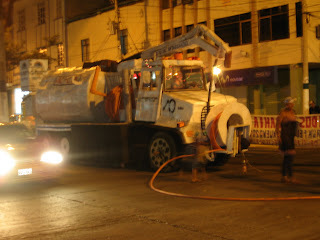 As well as being full of people the ciudela streets had a serpent-like train undulating through the crowds. 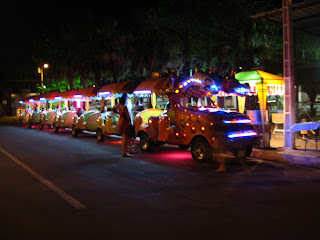 It was fun to ride through Bahia and the crowds, music blaring, and neon lights flashing for a 15 minute excursion. The length and visibility of the train enabled it to command the streets drunkenly weaving , and sometimes circling and chasing its tail in a wide intersection. 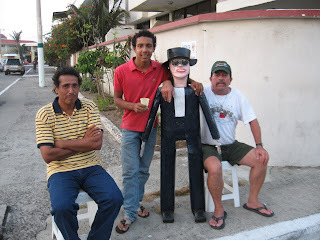 New Year's Eve in Bahia de Caraquez, Ecuador - plenty of fireworks all day long , bonfires, music and dancing. Here you can purchase almost any kind of fireworks imaginable - Ecuador is right behind China in the production of fireworks - however we do not remember the country ever presented in Vancouver's famous HSBC Celebration-of-Light or Bensen Hedges Symphony of Fire on English Bay. At approximately 10:00 p:m everyone in the city - young and old - walked to the malecon and lined the beaches for an hour long fireworks display presented from dueling gabarras in the estuary. The evening sky filled with a full moon, and many twinkling stars boomed with resonating explosions and was soon filled with smoke and the pungent odour of gunpowder. The show was so close to the shoreline that you could often see the falling embers from the fireworks sizzling as they hit the water. Although not choreographed to music the quality of the presentation easily rivaled any of the shows we had seen on Vancouver's English Bay - probably the best fireworks display either of us had ever seen. South America is well known for grand fireworks displays for New Years - Valparaiso and Caracas hold some of the largest and most famous. In Chile more than a million visitors are expected on Valparaiso's beaches, hills and rooftops to watch 37 tons of fireworks explode in a 22 minute display ringing in 2010 Chile´s bi-centennial year. Following the fireworks we strolled the barrios or neighbourhoods in Bahia Where the neighbors have gotten together elaborate themed presentations, music and dancing. 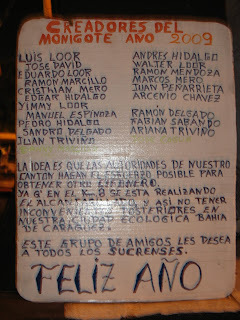 These block parties are everywhere and although gringos are very welcome, there were very few to be seen. Upon further consideration we realized that they have continued to embrace the North American tradition of smaller home gatherings - usually due to the inclemental weather at this time of year. 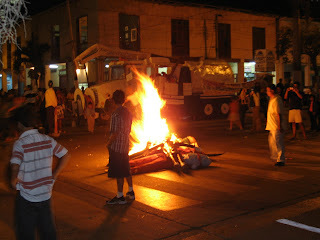 One of the most important Ecuadorian traditions for ringing in the New Year is the making and burning of años viejos or monigotes. 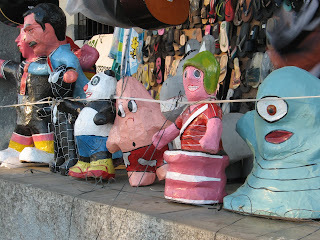 These sawdust-stuffed, and charged with fireworks, creations represent the passing hardships and troubles of the past year and they are burned away in the middle of the streets at midnight. You may make yourself or purchase one from several talented creators who have made this a very successful business. 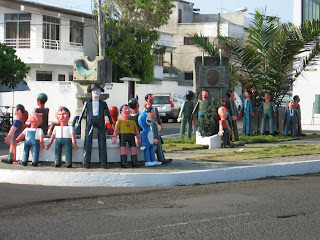 Effigies made represent local and international politicians, famous celebrities, cartoon characters, or many other imaginative creations. 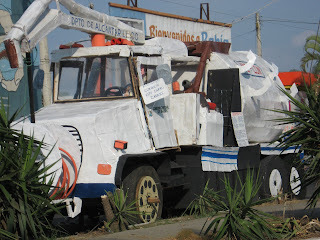 Bahias most creative and popular this year was a life size effigie of a water tanker. 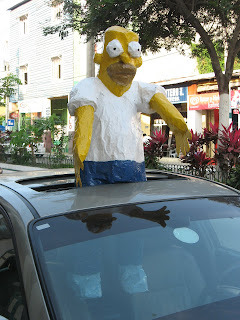 They are made from paper mache or old clothes sewn together and stuffed with firecrackers and sawdust (newspaper or any other flammable material can also be used). 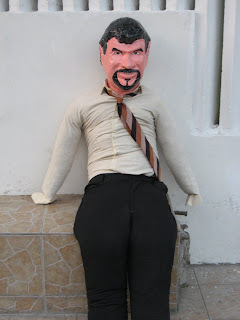 The heads of the effigies are covered with paper måché masks, shaped into caricatures of politicians or other people who have been in the news, generally for scandals. 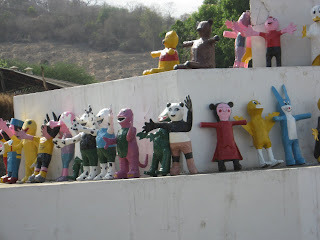 The custom is often seen as social and political commentary as the effigies will represent the year's top news stories and scandals. 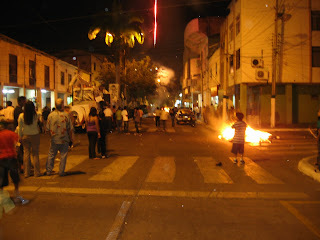 At midnight the sky filled with rockets, the street with firecrackers and screechers, and huge bonfires leaped up in the middle of the street on every block. The anos viejos have been ripped from their staging sites and thrown into the bonfires, shrieking as their firework stuffed innards explode. An hour after midnight the city streets were littered with the smoldering remains of the "old year" - it looked like a war zone - and everyone is ready for a fresh start to the New Year. 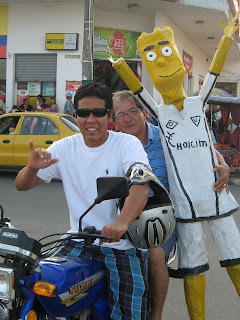 One of the advantages of living in South America is how free you are to live your life. Government has more important issues to deal with than interfering in community life with bureaucracy and making or enforcing regulations. There is a cultural understanding that you can live the way you want to, and your neighbors will do the same. With fireworks you can set them off anywhere, anytime to your heart's delight, and people around you will applaud, not complain. Now the food, music, and dancing began and was vibrant until sunrise. While we retired for some rest, when we awoke the next morning festivities and music were still going strong. So next year you should plan for a tour to Ecuador during this holiday season and enjoy the charm and excitement of the many festivities during this period. 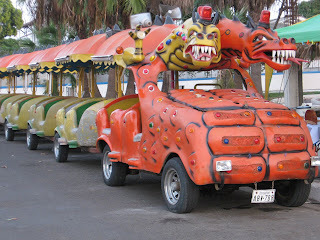 Ecuador is such a diverse and peaceful country. The weather, the colonial cities and the people are just fantastic. Nothing compares to the landscapes of the Highlands, the lush of the Amazon Rainforest, the exotic Beaches of the Coast and the mystery of the Galapagos Islands.